Caviar from sustainable farming! - ligam1s Webseite! 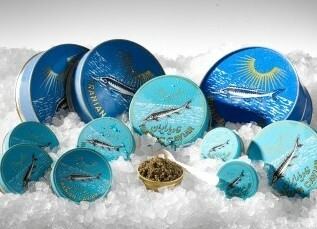 Has always been the best and most famous caviar comes from the coast of the Caspian Sea in Iran. Due to the international convention on biodiversity CITES fishing of wild beluga sturgeon is now strictly forbidden - and that's a good way to protect the shrunken inventories. A great alternative is the caviar Iranian breeding. The interplay of Persian experts and German know-how gives a perfect result: Fantastically beautiful and very large grain, clearly defined and sparkling, with gorgeous uniform color and creamy delicate flavor. ROYAL means that only selected sturgeon eggs are processed. The strict selection follows a microbiological, genetic, optical and taste control - only TOPWARE may be sold in this quality! The caviar is fresh packaged, is not pasteurized and lightly salted. Therefore, the stable for at least 8 weeks. Learn more about our merchant offer and contact us.